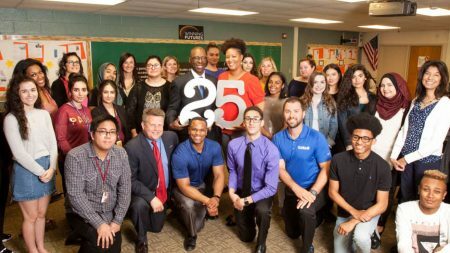 As we celebrate our 25th anniversary, we are excited to rollout Workforce Prep, a cutting-edge experiential program that will expose students to businesses and new technologies while teaching them the humanistic – critical – soft skills they will need to be successful in a world filled with automation and artificial intelligence. Alumni will be provided monthly support and professional development workshops as they move into their credentialed program (vocational education, community colleges, or universities). Sam Cupp founded Winning Futures in 1994. In the first newsletter he wrote, “Showing students the basics and the framework of goal-setting, achievement, and five-year planning is providing them a unique opportunity to learn about goal-setting tools that will be good for a lifetime.” Back then, the world operated vastly different, yet the core concepts of the program are just as important today as they were then and will be in the future: skills in goal-setting, five-year planning, communication, problem solving, critical thinking, and positive attitude. Some things never change.